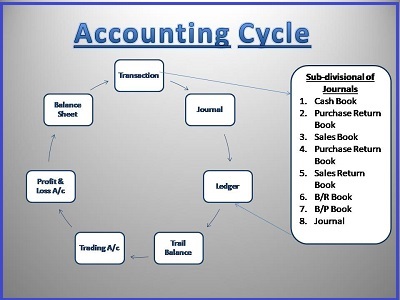 Accounting Cycle is that cycle in which all the business transaction are recorded, classified and summarized. It is also known as Accounting Standards. Books of original entry: firstly all the business transaction is recorded in the books of original entry, called as Journal. In this book all the transactions are recorded as per the 3 Golden rules (Real account, nominal account and personal account). Journal is sub divided into ‘sub-journal’ or ‘subsidiary books’. Classification or Ledger posting: All the transaction recorded in the Journal or in the subsidiary books are transferred (posted) to various Ledger accounts. In this process, date wise recorded transactions are classified item wise. Thus, this is the second stage of recording and all the separate accounts are made as per item given. Summary: At the end of the accounting period all the ledger account are balanced and these shows the balances are zero on both side of debit side and credit side. A list prepared in the form of debit balance and credit balances, called as Trail Balance. If all the recordings and postings and balances are correct then financial statements or final accounts are prepared. Accounting is a process of identifying, recording, measuring, classifying, verifying, summarizing, interpreting and communicating financial information. Accounting is a process to know the financial position of the company, that if ,we are earning Profits or Losses. 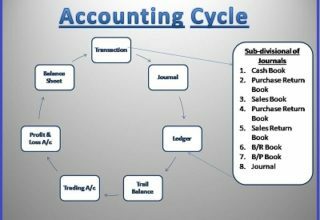 Accounting consists of all the acts of counting and thinking of accountant……. accountant handles accounts where they record all the transactions recorded by the Bookkeeper in the book of accounts…..
Accounting is a process of keeping records of financial reports to know the financial position of the company. Accounting is all about debit side and credit side……Get your Knowledge bank from us and join for free Demo Class. Call today at NTPR Centre 0172-4181444/9781090222. https://www.ntprcentre.com/wp-content/uploads/2017/11/25893873-word-cloud-with-accounting-related-tags.jpg 310 450 Preeti Raina https://www.ntprcentre.com/wp-content/uploads/2018/10/logo-yellow-300x94.png Preeti Raina2017-11-16 07:16:452018-06-07 05:09:07What is Accounting? Is a used to create a Web document or a Web page. Tell the way in which the document is to be read by the browser. Consist of tags that you can use to insert graphics ,colors ,font for the various elements on a Web page. https://www.ntprcentre.com/wp-content/uploads/2018/10/logo-yellow-300x94.png 0 0 Preeti Raina https://www.ntprcentre.com/wp-content/uploads/2018/10/logo-yellow-300x94.png Preeti Raina2017-06-27 07:08:212017-06-27 07:09:34What is HTML ? • Relationship among tables is maintained in a RDBMS whereas this not the case DBMS as it is used to manage the database. • DBMS accepts the ‘flat file’ data that means there is no relation among different data whereas RDBMS does not accepts this type of design. • DBMS is used for simpler business applications whereas RDBMS is used for more complex applications. • Although the foreign key concept is supported by both DBMS and RDBMS but its only RDBMS that enforces the rules. • RDBMS solution is required by large sets of data whereas small sets of data can be managed by DBMS.